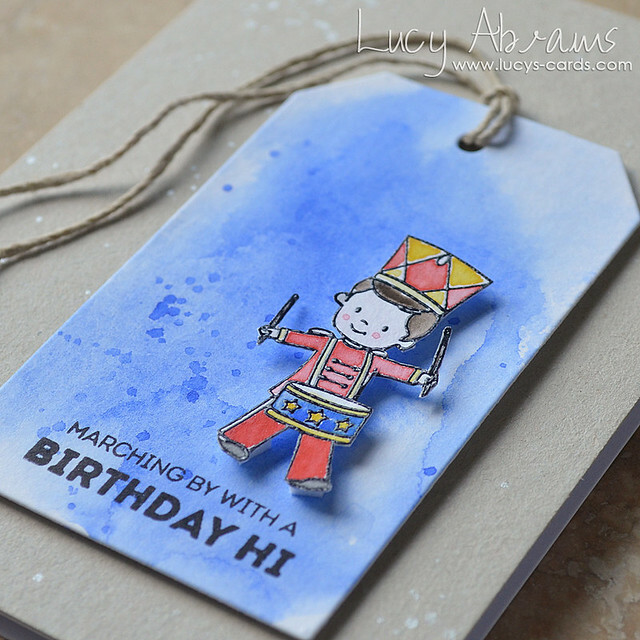 Lucy's Cards: A Birthday Hi! Today Simon Says Stamp is continuing its amazing STAMPtember celebrations by releasing another exclusive stamp and die set - this time, they have paired with the incredible WPlus9, one of my favourite stamp companies. The stamp set is a cutie - it's called Band Camp, and I have created a card with it to share with you. I stamped the little drummer boy in Versamark and black ink onto watercolour paper, then clear embossed. Finally, I watercoloured him. The tiny details required a very small brush (and steady hand…). After cutting him out, I added my little guy to a watercoloured tag, adding the sentiment and some ink splatters. I used some Natural Cord to match my background cardstock which I splattered with some shimmery watercolour paint. Love the detail… this is such a sweet set. OK - that's all from me today, but head over to the Simon Says Stamp blog to see links to lots more cards created with this set. That's adorable. Perfectly colored. The tag is a great idea. You do very nice work. Thank you. Awesome watercolored card! I love the tag mounted on Kraft card! The large tag on the card gives a new look! Well done! Very cute, great color choice. 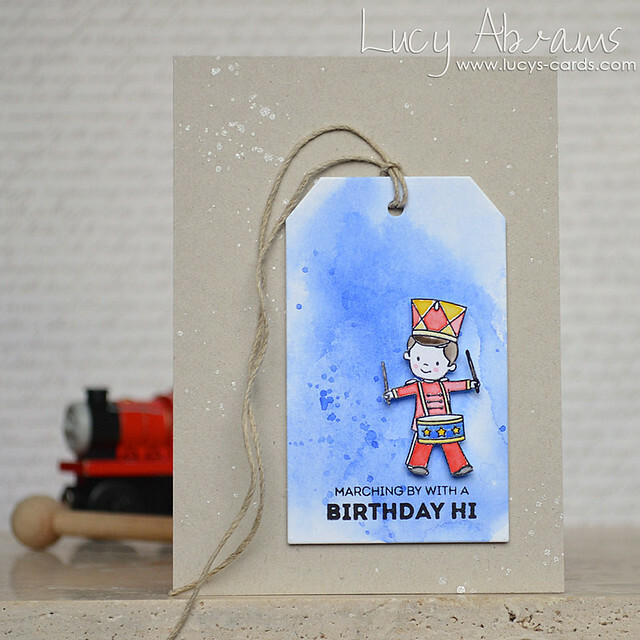 WOW - your SUPER CUTE tag makes an ELEGANT card Lucy!!! LOVE your colour combo & colouring, ADORE your backgrounds!!! Adorable! Love this new stamp set. Aw, this is so adorable! I love, love, love your watercolor tag! This is an adorable tag attached to a card. Thanks for sharing.